The newest edition of Cambridge University Press’s Camden Series of annotated primary source documents features “the continental travels of the Irish landowner Henry Piers and his conversion to the Catholic faith in Rome, during the heightened political and confession tensions of the 1590s.” The volume is edited and introduced by Brian Mac Cuarta, SJ, the director of the Archivum Romanum Societatis Iesu. Piers’s travels continued into Spain, “where he visited English Jesuit colleges in Valladolid and Seville,” hinting at connections he made through the Jesuit Robert Persons. 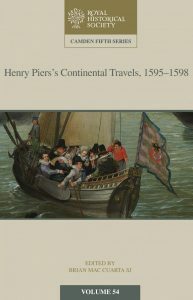 More information about Henry Piers’s Continental Travels, 1595–1598–including Mac Cuarta’s helpful introduction and bibliography–is available at the Cambridge University Press website.